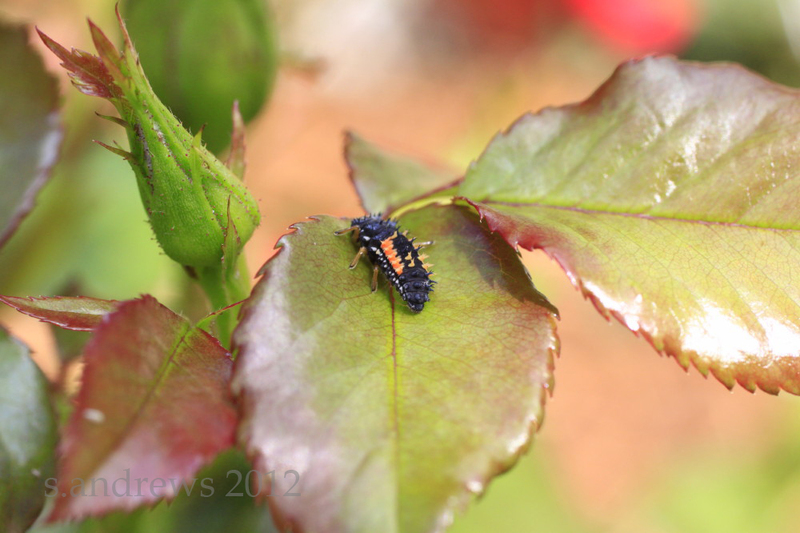 ladybug larvae * garden residents, or visitors? 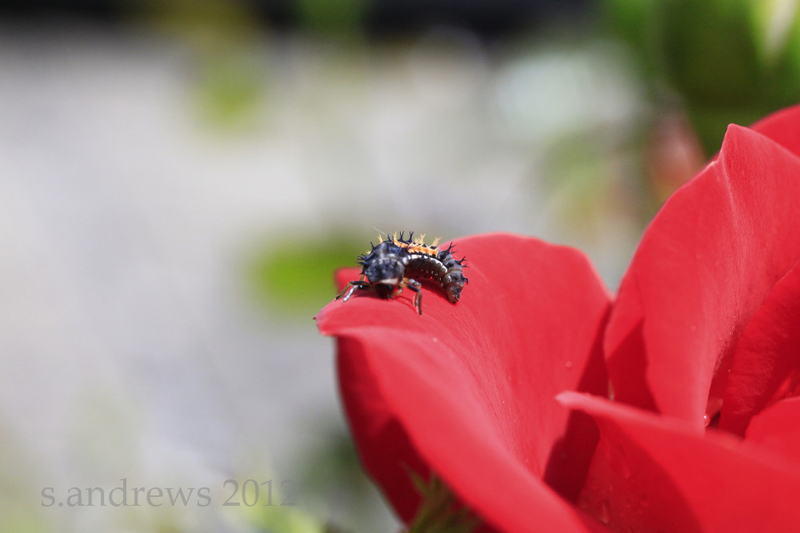 Last month I welcomed visitors to my garden; both my gardener friends and these tiny red and black insects. 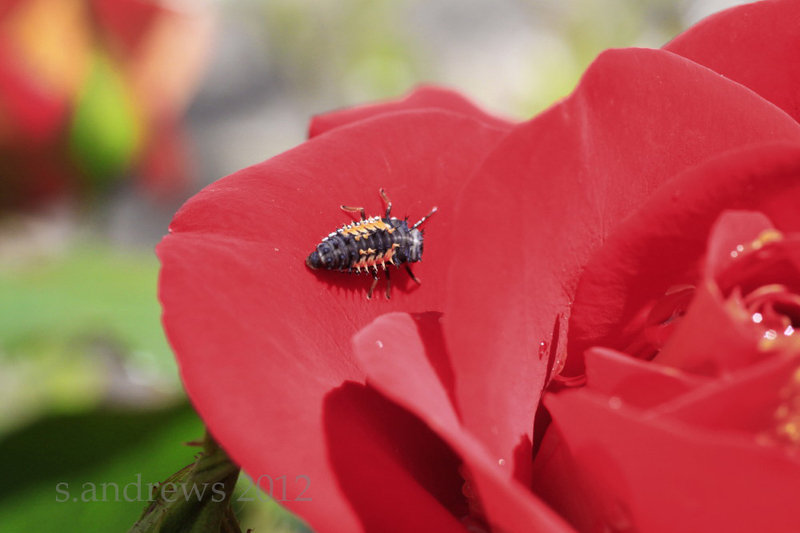 As I waited for my human visitors to arrive I was taking photos of the new rose we planted this year (it’s called Ketchup and Mustard) and noted a very large Ladybug larvae cruising around on the buds and blooms. He stayed for both days of my Open Garden, and I was able to get out my Lupe and share the magic of his visit with my guests. 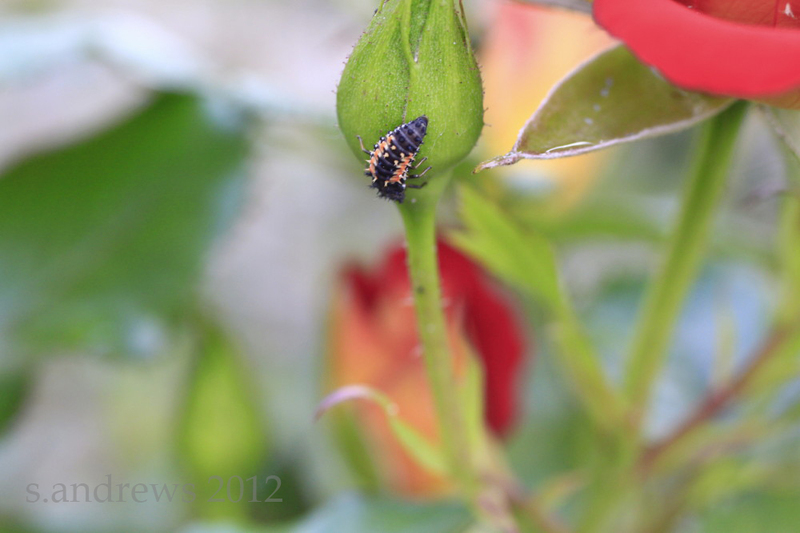 My macro lens captured these photos, to record his visit for all time. 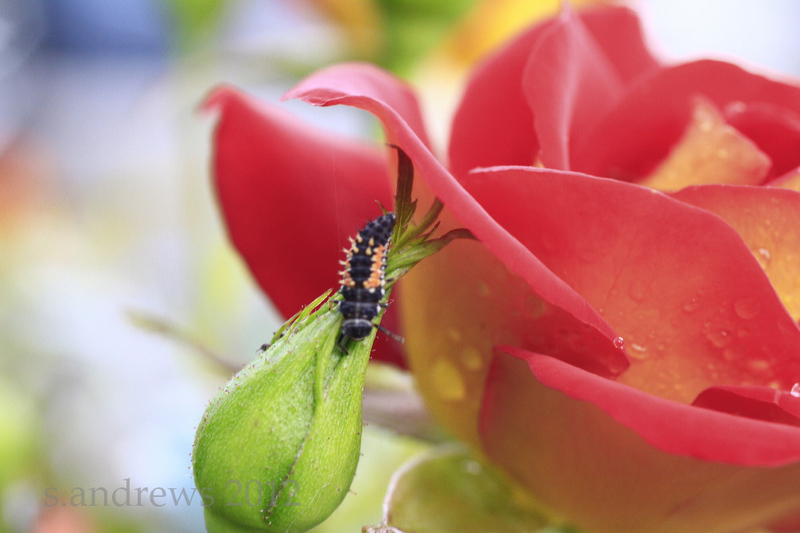 I am sure that he has grown up by now and become the winged Ladybug he was meant to be, but I was entranced by his movements on the roses. 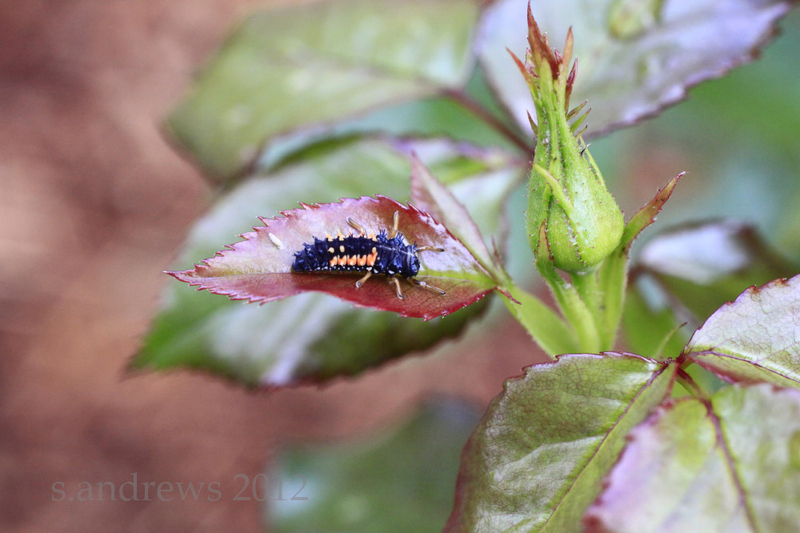 I have seen his brothers on many of my roses since then, taking care of the aphids that have moved right in this summer. I love watching the magic that is my garden, the blooms of the plants unfurl, the small plants get larger, and the insects come and go. Of course I can do without the aphids, and I know the spiders are beneficial and all, but I don’t really care to walk thru the webs every morning. But I know….it’s all part of the cycle of life, happening every day, every season with or without me. I was very impressed by this series of photos. 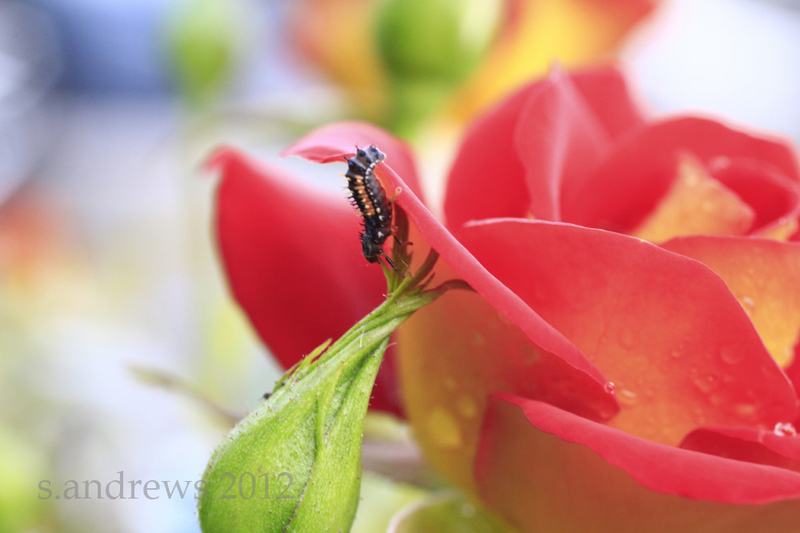 The plants, the bug, the lighting; the lens that captured it perfectly. It’s not hard to be a good photographer with such a beautiful subject in my viewfinder! Enjoy the photos, without captions or interruptions. You can either scroll down the page with the thumbnails or click the first image for a photo carousel of larger images to click through. 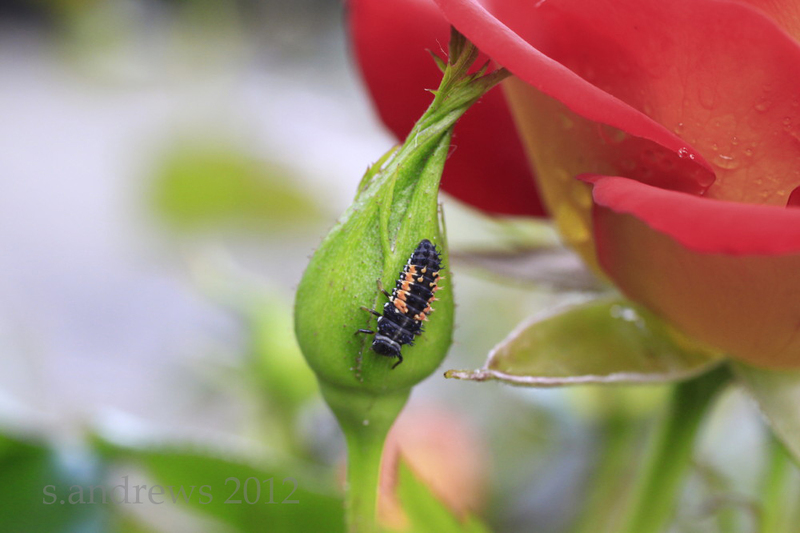 This entry was posted in in the garden, Oregon, Portland, uncommon everyday art and tagged garden, Harmonia axyridis, June, ketchup and mustard rose, Ladybug, Ladybug larvae, macro lens, Red, red and black, rose garden, Roses. 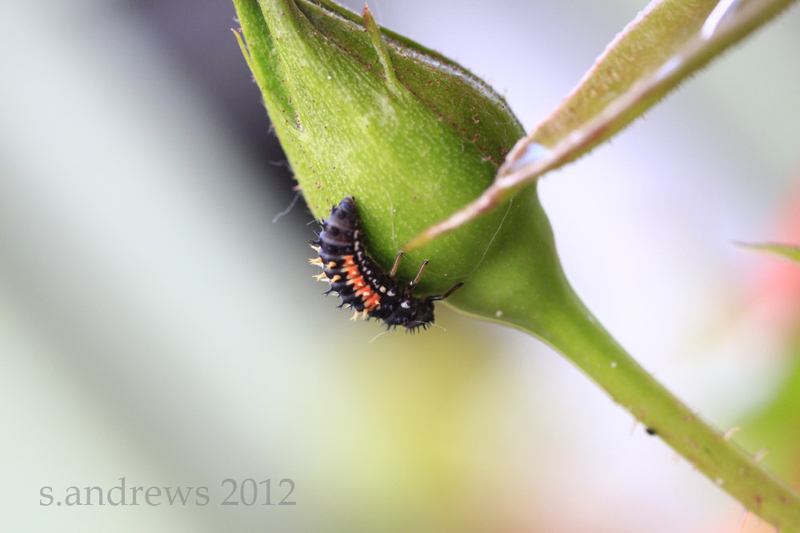 I had no idea that was what lady bug larvae looked like. Good to know! 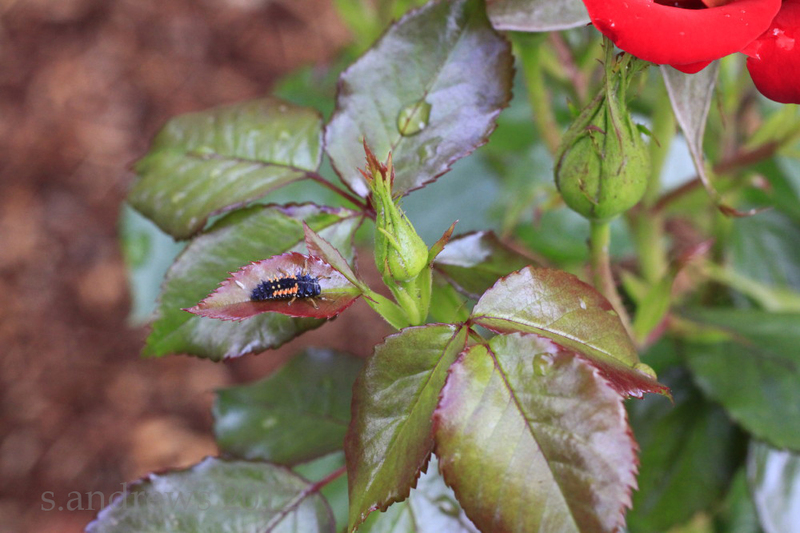 Since you are talking about roses – what do you suggest to rid of or lessen black spot on the rose leaves? Enjoy your summer! 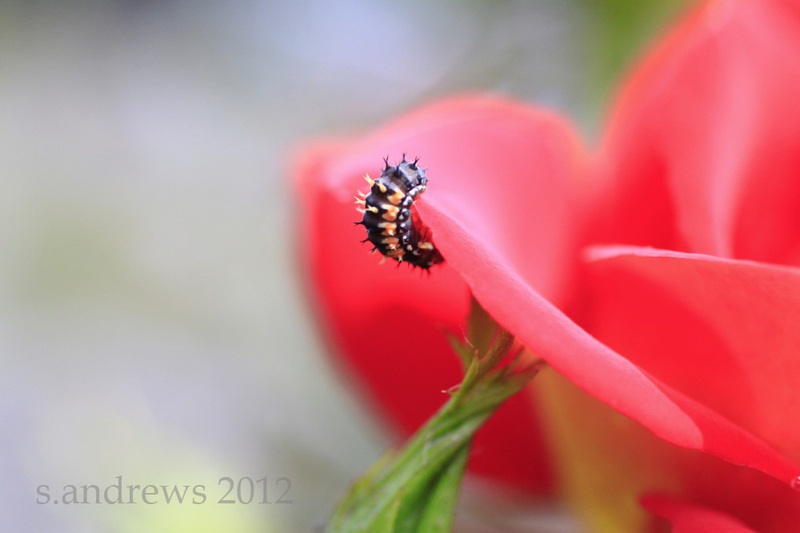 I love the way my garden is always surprising me, showing me things I didn’t know before! 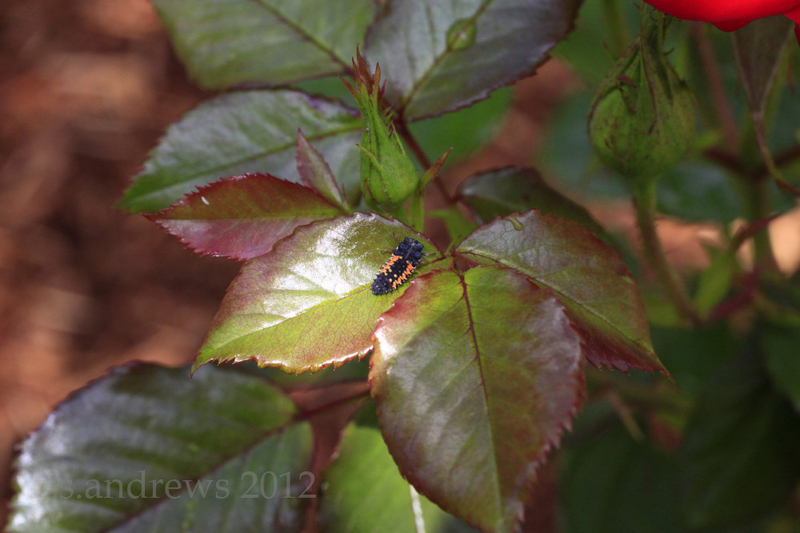 Black spot on roses is a perennial problem, that is for sure! I have a spray program in place. 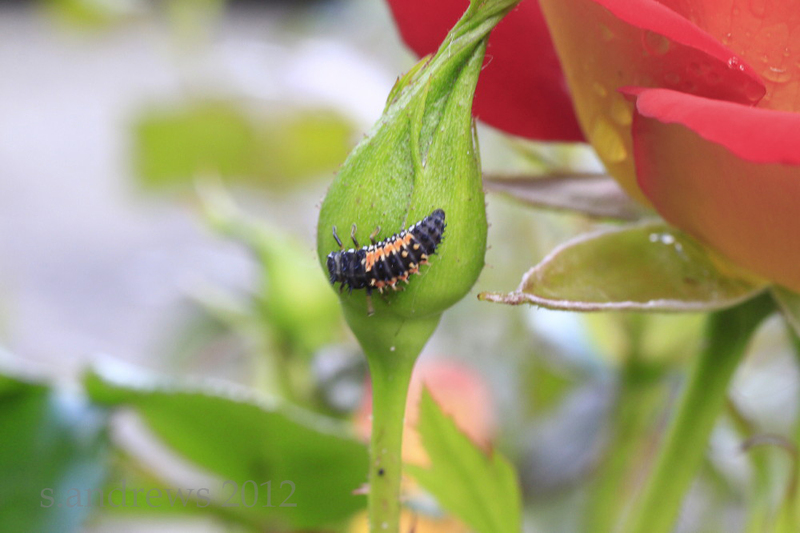 There are many great fungicides in the garden centers to try. You should also keep the plant clean by removing the affected leaves; a healthy plant can better resist problems too. Another good practice is the give the plant a good blast of plain water from the hose in the afternoon or early evening to wash off any fungus and pests from the day. Make sure you do it early enough so the leaves have a chance to dry before dark. 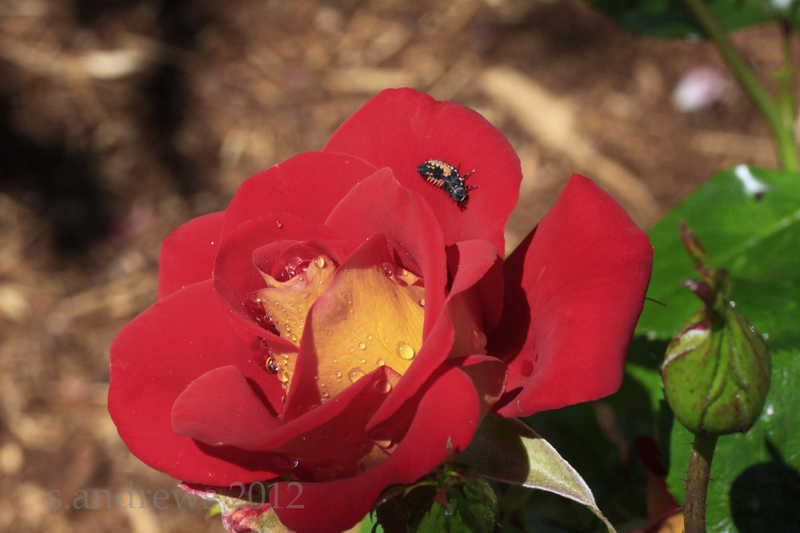 If the black spot gets to be too much you may want to replace the plant with a newer, more resistant variety. 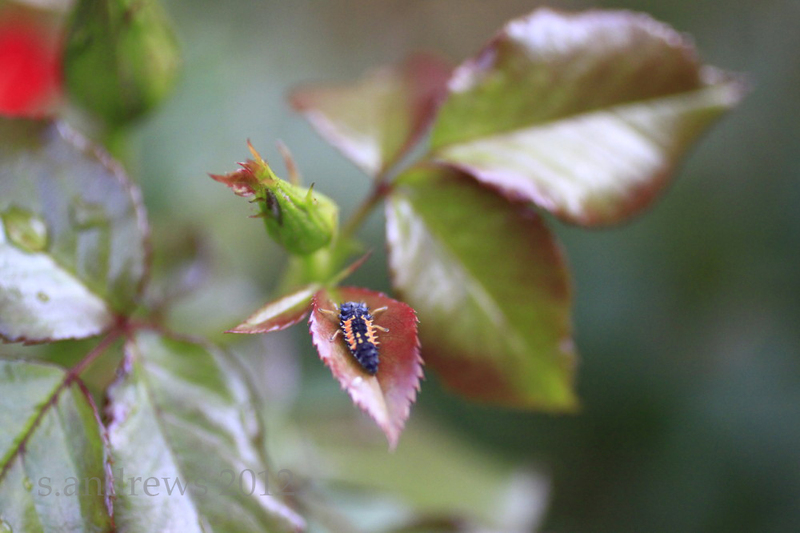 The end of the season is a great time to get good deals on roses!